The Cuba Australia Video Exchange component of Intercambio, a five-year visual arts and research project developed by CAST, RMIT School of Art, and conducted between Australia and Cuba. Intercambio: Cuba Australia Video Exchange is a part of a five-year artist residency and exchange program between RMIT School of Art and the Wifredo Lam Centre for Contemporary Art, culminating in a presentation of Australian works at the 2019 Bienal de la Habana. The Video Exchange focuses on the works of seven women artists from Cuba and Australia. The exhibition brings into focus shared concerns for artists in the geographical South, with particular emphasis on themes of identity and social participation. Inspired by the strength and dynamism of artists making art with exceedingly limited means, the exhibition is a dialogue between female practitioners in Cuba and Australia. The artists include Diana Fonseca Quiñones, Adriana Arronte Rodríguez, Susana Pilar Delhante Matienzo, and Naivy Peréz who have come together with Australian-based artists Mia Salsjö, Robyne Latham and Angela Tiatia. One gallery, two countries, seven artists and many intersections. An aesthetics of the everyday, or rather a deep consideration of activities that constitute the ambience of daily life, sits at the heart of the exhibition Intercambio: Cuba Australia Video Exchange. The exhibition brings into focus a range of art practices emanating from two notably contrasting countries ­– The Republic of Cuba and the Commonwealth of Australia. These are practices that emerge from a confluence of artistic, personal and communal life, from the deep processes of artistic reflection and the casual events of daily existence. They point to a variety of ways in which meanings and signifiers coalesce – through rituals, actions, celebrations, through witnessing and mourning and in the simple and not-so-simple acts of being and being in the world. Such gestures may take place in private or in public space, involving a single artist-performer or a multitude of participants. The included works make no apology for being anything other than what the viewer perceives. At times, they evoke a poetry that is emergent rather than apparent, while in other instances the gesticulation is plain to see. In contrast to much of contemporary art today, the spectacular as artistic strategy has been momentarily suspended. For Australian audiences, the range of screen-based works emanating from the Caribbean nation of Cuba may come as a surprise. In contrast to the clichés of Cuban life, the insights offered by this exhibition into a rich vein of video art – and especially those individuals whose practices reside in performance and action-based works – reveals the extent to which critically artistic discourse is very much a part of the island nation’s culture, especially so with its roots in the Cuban Revolution of 1953­–1959 and the subsequent decades resisting the US­-led Blockade. As the home of the Bienal de la Habana, the so-named Bienal of the Third World, which was inaugurated in 1984 and which will reach its 13th iteration in 2019, the context for Cuban contemporary art is at once entirely localized and internationally informed. With the development of a partnership between the Bienal de la Habana and RMIT School of Art, which has blossomed now into a five-year research process with projects and residencies in each country, the opportunity to extend the dialogue between Cuban and Australian artists has given rise to this meeting of artistic practices. Inspired from the outset by the strength and dynamism of young female artists working in Cuba today, including many who are making do with exceedingly limited means, the exhibition was envisaged as a dialogue between practitioners. A shared interest in issues pertaining to identity and ethnicity, to connection and universality, and to how especially those issues intersect with gender as a marker in society, forms the common thematic ground. Hailing from Cuba - Diana Fonseca Quiñones, Adriana Arronte Rodríguez, Susana Pilar Delhante Matienzo, and Naivy Peréz have come together with Australian-based artists Mia Salsjö, Robyne Latham and Angela Tiatia. In the case of Diana Fonseca and Adriana Arronte, a residency in 2016 at RMIT School of Art in Melbourne provided an opportunity to develop new works and to consider relationships between the two localities. Mia Salsjö is a former Habana resident and has family connections in the two countries, and along with Robyne Latham and Angela Tiatia will present work in the 2019 Bienal de la Habana. While such a dialogue draws out similarities and differences between these decidedly contrasting cultures, it is the work of Cuba’s most celebrated contemporary artist Ana Mendieta (1948–1985) that brings to mind ways in which artistic language is capable of transcending the limits of culture and place to produce something that aims for universal connection and understanding. Mendieta, a radical in her time and an artist of lasting renown, died in circumstances that were both shocking and disturbing. For many, her passing remains unfinished business. Yet Mendieta’s legacy has also inspired many younger practitioners. As an émigré to the United States, her works are at times infused with themes of an absent presence and a yearning for spiritual connection. This includes her well-known Siluetas, being some 200 ephemeral pieces in which the artist has used her own body to create distinct depressions in the earth. According to Mendieta, her art was a means to “re-establish the bonds that unite me to the universe”. Susana Pilar Delhante Matienzo pays homage to Ana Mendieta – that is, to Mendieta first and foremost as a person. In her epic Santerea ceremony Contacto (Cajón en homenaje a Ana Mendieta), young and old pay their respects to the artist in a scene that reminds the viewer of how much this artist is admired in her birth country. Similarly, Angela Tiatia’s consideration of the artist is also redemptive. Tiatia creates a video homage that responds to an earlier artwork by Mendieta’s teacher, collaborator and sometime lover, Hans Breder (1935–2017), titled La Ventosa (The Sucker), 1971. It is a black and white photograph in which Mendieta’s legs, washed by an incoming tide, are presented directly to the viewer, while at the same time, the upper half of her body is concealed by a deliberately truncating mirror. The recognition of a headless (ie anonymous) and sexualised female form, offered up by a male photographer to a presumably male spectator, can scarcely be discounted when contemplating an image such as La Ventosa. 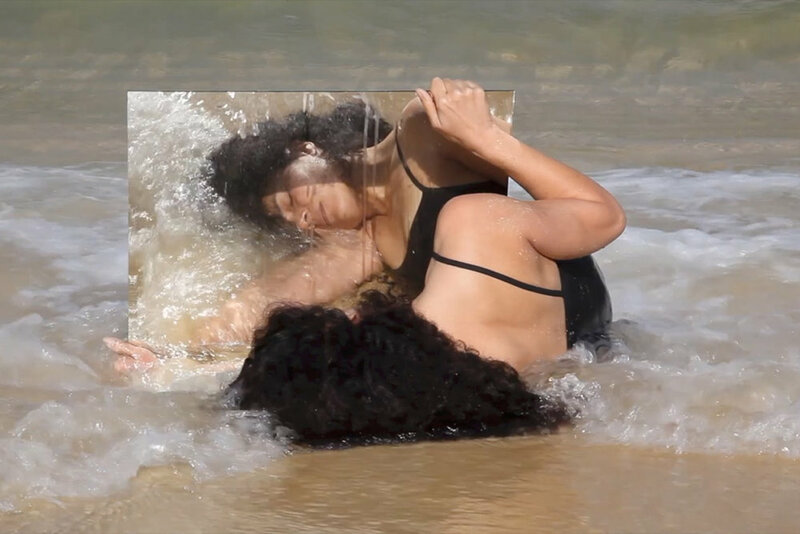 Tiatia’s response is to both possess and invert the scenario – the artist, with the use of a similarly placed mirror, presents her own self-portrait. And just when we think that is all there is, Tiatia enacts a sudden and explosive shift in to an imagined inner journey. Naivy Peréz, in her 2008 performance work titled Celda (Cell), also makes reference to Mendieta, especially in her bid to signal connection with the earth. Filmed in a public park in the Habana suburb of Vedado, Perez’s hair is seen to take root in the ground on which she stands. It forms a cage that is both protective and also prohibiting, an enclosure that embodies quite clearly the paradoxes of a given identity. Similar themes are evident also in the work of Robyne Latham. Latham has created a series of open-sided cages and set a camera to catch the action. The creatures that inhabit these wicker structures are free to come and go, oblivious to the fact that they may or may not be ensnared. The theme of ritualized gestures is apparent also in the work of Mia Salsjö. In her performative video, Words fail, 2015-18, the artist has commandeered a road bridge on the outskirts of Habana, where she directs a ritual unfolding of fabric banners. Notably, the white banners, empty of signification, stand for no country, group or ideology. Instead, as they dangle from the side of the aging bridge, they seem only to mark a point of transition and potential. The work may be read as a homage to the inevitability of change and those necessary acts of transition that are required in the process and making of art – for instance, the bridge from the unknown to the newly discovered. Diana Fonseca Quiñones also engages with transitions, both thematically as a part of her artistic process. Her video work Pastimes, 2003, involves a series of objects passing through the palms of the artist’s hands. In this instance, it is money in the form of coins that gyrate in a circular motion, leaving nothing but discoloured stains in their wake. All the while the video is accompanied by the sounds of a commercial cash register, rhythmically marking the day. Certain acts of transition are apparent also in the work of Adriana Arronte. Her performance-based video titled Blood clots, 2016, reveals the artist in a battle with seemingly bloody forms, staged from within the confines of a local boxing ring. At first glance the lifeless shapes appear like frozen sides of beef; but in fact, they are sculptures made from candy that crash into one another as the artist unleashes her fury. The work is a protest against violence, especially as an act of spectacle or sport, yet the work has required a curious transformation of sugar-based sweets into solid and ungainly lumps of matter. What these pieces remind us, is that more than anything, it is a yearning for the universal and the desire for connection and understanding, that is at the heart of this ongoing project. As a part of the five-year Intercambio between Australia and Cuba it is our aim also that this dialogue will continue well into the future and may kindle future projects and connections across the two countries. Diana Fonseca Quiñones’ practice is built on using simple, commonplace objects and experiences from daily life to devise narratives that mix reality and fiction. Drawing on seemingly irregular, everyday moment, such as sharpening a pencil or lighting a match, Quiñones’ work employs poetic metaphors that cleverly comment on broader social issues and universal human desire. She is represented by Sean Kelly Gallery, New York. Based in Havana, Cuba, Adriana Arronte Rodríguez (b.1980), graduated from Fine Arts, High Institute of Art (ISA), Havana in 2006 and from the San Alejandro Academy of Fine Arts. Havana Cuba in 2001, prior to which, she studied at the School of Visual Arts José Antonio Díaz Peláez. Her practice includes installation, site specific performance and public interventions. Susana Pilar Delahante Matienzo (b. 1984) lives and works in Havana, Cuba. Her work explores the obstacles and challenges that women face from both a personal and global perspective. Working mainly in video, photography, and drawing, Matienzo is unflinching in her approach to address the act and effects of violence against women, often producing powerful and disruptive visual images. From 1998 until 2008 Matienzo studied in the Elemental school of Visual Art, the Fine Arts Academy and the High Institute of Arts (ISA) in Havana, Cuba. She pursued post-graduate studies in New Media, from 2011 to 2013 at Karlsruhe University of Arts and Design in Germany. Naivy Pérez (Ciego de Ávila, Cuba, 1986) graduated from the Instituto Superior de Arte in Havana. Her artistic process shifts from radical, lyrical performances to minimalist installations integrating new technologies. For years, she has worked on a series of performances in which she tries to embody a number of social roles associated with the Cuban woman (housewife, brave soldier, prostitute, etc). In addition, she explores the world of Net art, often in collaboration with the artist Rewell Altunaga and Rodolfo Peraza as part of Neturn collective designing interactive works that include motion or light sensors. Over a thirty-year period Robyne Latham’s work has traversed media and form, with a strong emphasis on the object in space, where space itself resides in a metaphysical realm. In the last decade Latham’s art practice has explored the principles of social sculpture, employing action, thought, and object. As a multimedia artist, Angela Tiatia explores contemporary culture, drawing attention to its relationship to representation, gender, neo-colonialism and the commodification of the body and place. Her work has been exhibited in Venice, Köln, Singapore, Los Angeles, San Francisco, New York, Mexico City, Honolulu, Sydney, Melbourne, Auckland and Wellington. She is represented by Sullivan + Strumpf, Sydney. Born in Melbourne, Australia, Mia Salsjö graduated from the Victorian College of the Arts in 2010 with qualifications in both Fine art (Masters) and music improvisation. Since then she has been practicing between Australia, Indonesia and Cuba, developing projects that interweave cross-cultural imagery, music notation and socio-political symbolism. Salsjo is currently working on a major project for the 2019 Bienal de la Habana, Cuba. Dr Damian Smith is a freelance curator, arts writer and academic based in Melbourne, Australia. A former resident of Habana, his doctoral dissertation – Barefoot Curating: Contemporary Art and the Role of the Freelance Curator – draws largely on his experience working with the Bienal de la Habana and associated cultural institutions. In 2016 the State Library of Victoria established the Damian Smith Archive, which contains approximately 200 published essays on contemporary art, along with additional artworks and ephemera. In 2016, Smith was an invited guest speaker at the UNESCO–sponsored International Association of Art Critics World Congress, held at the Museo Nacional de Bellas Artes, Habana, Cuba. IMAGES | Susana Pilar Delhante Matienzo, Contacto (Cajón en homenaje a Ana Mendieta), 2015, video documentation, dimensions variable, 1:06 hours | Angela Tiatia, Untitled, 2018, detail, still from video, 2:08mins | Courtesy the artists.